Established in 2010, the House of Emilio is now home to nine different brands, and that number seems to be growing by the month. These are all boutique blends, made and distributed by cigar enthusiasts with the passion and resources to blaze new trails through a field dominated by industry heavyweights. What is unique about this consortium is that it doesn’t operate like a business conglomerate. The brands are all made independently and retain their individual identities. As the creator of the house, I would expect the Emilio brand to reside in the Master Suite, but the other brands have their own rooms, and it looks like the additions and improvements are still coming. 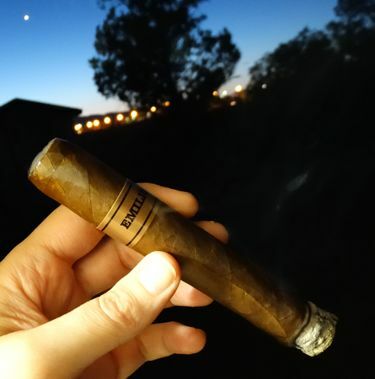 The House of Emilio was kind enough to offer me the grand tour, or at least a glance through the porch window, so over the next few weeks I plan to offer a few unvarnished thoughts on what I’ve seen and smoked. Probably the best known of the 8 or 9 different blends that fall under the Emilio brand umbrella, the AF-1 is a delicious cigar reminiscent of A.J. Fernandez’s San Lotano Maduro. Strangely enough, I had just smoked one of these the night before I lit up the AF-1 and remarked on its similarity. It would have been no surprise, had I done my homework, because the AF in the name of the cigar stands for Abdel Fernandez. Like the San Lotano, the star of the AF-1 is its San Andres maduro wrapper. The bones of the blend are Nicaraguan, naturally, but that is as far as mere mortals are allowed to see into its musculoskeletal structure. 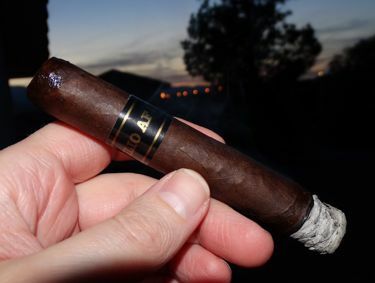 What I noticed most about the AF-1 was that the flavors were similar to the San Lotano, but the overall demeanor of the cigar was much smoother, creamier, and on the whole more enjoyable. This particular specimen had about a year to meditate and become one with my humidor, so maybe that was a contributing factor. But it’s easy to see why the AF-1 is one of Emilio’s best selling smokes. Chocolate and cedar are the highlights of the AF-1. There is a touch of astringency and a little roughness on the tongue which quickly dissipates, and from there it’s smooth sailing. The richness of the chocolate balances wonderfully with the cedary spiciness — a touch of pepper is a nice flourish. It’s similar to the San Lotano Maduro and also the Montecristo Reserva Negra – but in my opinion, better than either of those. A fantastic smoke. While I am not a BMF aficionado, I was still excited to set this log alight. The wrapper on the AF-2 is an Ecuadoran Oscuro, which sounds like a mythical creation but isn’t. Remembering that maduro and oscuro are fermentation and maturation processes as well as color designations, it is indeed possible for a leaf to be lighter in color than “oscuro” represents. In this case the leaf is a dark golden brown, not quite maduro in color. What’s the Spanish word for the color of an over baked peanut butter cookie? That would be close. The AF-2 is a solid stick, but the draw is very loose. It didn’t seem to affect the burn though, so perhaps the loose draw is by design. This cigar is fairly peppery with some cocoa on the nose and later on some nice caramel sweetness. It’s also quite potent — just the sort of thing that followers of AJ Fernandez will appreciate. 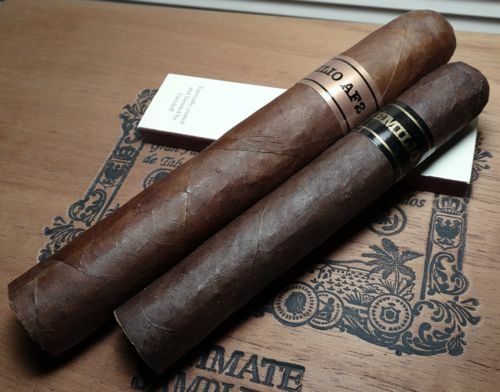 Both the Emilio AF-1 and AF-2 are upper echelon boutique cigars worth seeking out. The AF-1 is a tasty and well-balanced cigar that should appeal to all but the most jaded ligero junkies. For a smoker of medium-bodied maduros, it really doesn’t get any better than this. The AF-2 is a more potent, more complex cigar, at least in the BMF size that I smoked. I would like to try this one in a smaller size next time and see if it still knocks me overboard. Experienced cigar smokers and lovers of Fernandez blends will not be disappointed. Both cigars are competitively priced in the $6-7 USD range. I love both of these lines, but may actually prefer the AF-2. It seems to be a more “versatile” and complex smoke, but I can’t recall if I had the BMF. The AF Suave is a great morning cigar. Gary has certainly put together an impressive line-up of boutique companies.. Both are great cigars, I agree, and I see what you’re saying about the AF-2. I think it’s kind of a mood thing. I’ll have to check out the Suave at some point, you know, when I’m in the mood. The Ezra Zion FHK is up next. With so many great cigars on the HoE menu, it’s an embarrassment of riches. Not a dud in the bunch.